Leave it to mainstream media to make a Kilimanjaro climb look like a cake walk. Compared to paddler David Miller, rock climber Abbie Mood, and runner Sarah Menkedick, I’m probably the most sedentary member of the Matador team, but even I know that climbing Mt. Kilimanjaro is no Sunday stroll. But this little tidbit from ABC News, in which it’s reported that five celebrities will be doing a Summit on the Summit “charity climb” of Africa’s tallest mountain, makes the arduous trek seem exactly that. Emile Hirsch (of “Into the Wild”), Jessica Biel (of, well, you know), Lupe Fiasco, Isabel Lucas and Elizabeth Gore will step off on Thursday, aiming to reach the summit in an effort to “use star power to help raise awareness about the need for clean water worldwide.” Fans of these celebrities can follow the climb and donate “as little as a dollar” to raise money for the cause. Don’t get me wrong: I’m all for celebs using their status to do good. And anyone with 20-20 vision can see (Exhibit A) that Biel has a body that’s in way better shape than mine. But climbing Kilimanjaro takes a bit more skill and effort than putting together a charity ball, designing a reusable bag for Whole Foods, or even running the New York City Marathon… especially if they’re shooting video and Tweeting at the same time, as they apparently intend to do. Curiously absent from the article and from the Summit on the Summit website is information about how (or whether) the stars have trained for the ascent. Though I wish them the best of luck and hope they raise a ton of money in the name of clean water, I’m curious to see how they handle the climb. 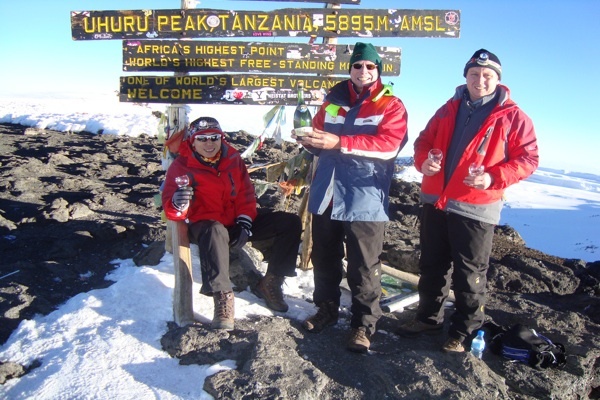 Matador member CaliforniaKid7 intends to summit Kilimanjaro this year. Read about his 2010 resolution in Summiting Mt. Kilimanjaro in 2010.